Whether you are an early bird or a sleepyhead, our all day breakfast menu will set the foundation for a great day on Koh Phangan. We offer a wide selection ranging from the famous big Phanganist Breakfast of champions to our healty option and everything in between. Around Full Moon we also have the most delicious homemade French croissants delivered daily straight from the oven by the Islands best French Bakery. The rest of our menu is inspired by our very own talented French and Thai chefs and is a mix of fresh salads, tasty bruchetta’s, open sandwiches, our famous beef burger and much more. First we eat, then we PARTY! At Phanganist Hostel we take good care of our people. During Full Moon the party level reaches another level and its important that you are energized and ready for the madness. To make sure our flashpackers are well fed for the parties ahead, we pun on not one but two FREE BBQ’s! 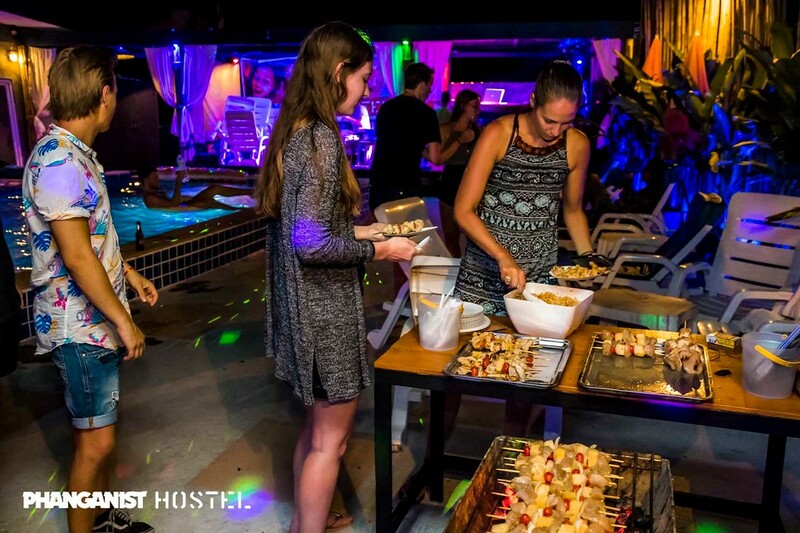 Courtesy of the Phanganist Hostel team and presented by our amazing chefs. For very hungry crews, there is a big table in the shade where you can have a family lunch and split french fries and burgers, in a beef and veggie version. All prepared with love, with four hands of our Thai – French chef duo.